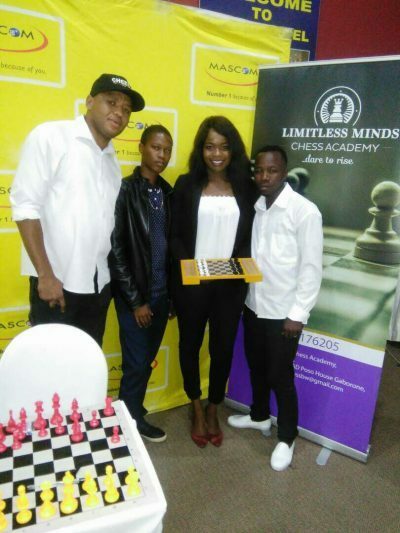 Limitless Minds Chess Academy was launched at Oasis Motel, Gaborone, Botswana on Saturday, 27 January 2018. Below is the transcript of the speech by Keenese Katisenge, founder of the academy. I welcome you all and on behalf of Limitless Minds Chess Academy,thank you for having taken time from your busy schedules to join us as we take a big step in our journey by officially launching Limitless Minds Chess Academy. Limitless as we prefer to call it, is a newly formed academy which subscribes to the International Sport Concept of Sport for All. The academy is based in Bokaa and is affiliated to the Botswana Chess Federation becoming the 7th chess academy under the Botswana Chess Federation and it is also recognised by the World Chess Federation. It has been months of hard work, many hours spent in discussions, fine-tuning the strategy and vision and getting the necessary paperwork in order and in place. So many people have been part of our vision and journey so far and we are grateful for their support and well wishes. Firstly I would like to acknowledge and sincerely thank Mascom for having seen it fit to partner with us in this endeavor. Mma Gotlop, we are grateful for the support and confidence shown in our programs. 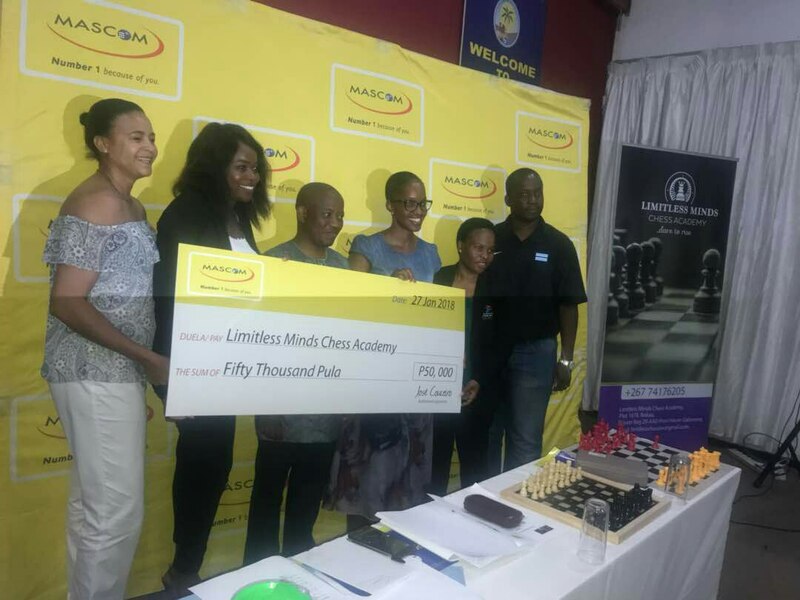 Mascom continues to be the leading corporate citizen of repute and we are thankful at Limitless that we have been added to the Mascom family. I would also like to specifically acknowledge and thank Dynamites Volleyball Club, a club which is has now joined the list of partners to Limitless Minds Chess Academy for its help in pushing for the academy to get registered. As our name Limitless Minds Chess Academy suggests we are unlimited in our thinking and in our approach to doing things. We believe that everything is possible and in a unique but fulfilling way would like to become the chess academy of choice. We would like to be the leading academy in Botswana and the whole of Africa when it comes to creativity, innovation and inclusivity. Our aim is to be the first mover in space by adopting an open-minded and modern way of introducing the game of chess to more people in Botswana and Africa. Through our sport for all approach to sport development at the academy, we would like to introduce programs designed to meet the needs of different communities within our society thus complementing the efforts of our mother body, being the Botswana Chess Federation and also in a way those of the Botswana National Sports Commission and sport in general. We see every community as well deserving of good sports programs and we would like to against all odds make the dreams of aspiring chess players a reality and that is why our Motto “Dare To Rise”. The disadvantaged through introduction of chess programs for people living with disability, those in rural areas and other disadvantaged and marginalised groups. 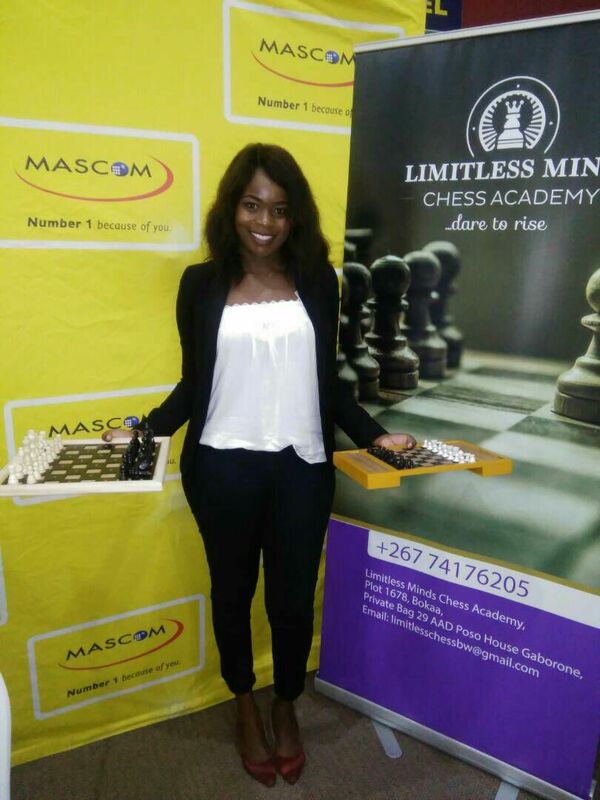 Limitless Minds Chess Academy Founder Keenese Katisenge shows one of the chess sets for the blind. Our programs under this initiative will include chess for the Blind, chess for refugees, chess in Prisons and other programs which we will add as we continue to grow as an academy. We will be taking things one step at a time. Chess for The Blind will start with training of trainers on 03 February 2018. The centre for the program is Mochudi Resource Centre which was identified through our partnership with the Botswana Association of the Blind and Partially Sighted and I would like to again acknowledge their presence here. We are also through the Botswana Chess Federation in discussions with the Botswana National Sports Commission and the UNHCR Office of the Chief of Mission – Botswana to ensure that the necessary protocol is followed for the Chess for Refugees Program to be introduced in Dukwi. We also plan to introduce reputable online chess events in Botswana. Our first online chess tournament which we will be running in partnership with Africa Chess will be hosted this year at a date to be communicated. We will work hand in hand with the Botswana Chess Federation, which continues to be very supportive to our initiatives, to improve accessibility to chess coaching around the country through strategic partnerships , for example with libraries, the business community and other partners around the country. Further, the academy will help add value through Empowerment workshops/ seminars, Chess training camps and hosting of International chess events of high standards. The main objective of these activities is to enhance the relevance of the game of chess and sport in the society. We will also add life skills training and empowerment to our programs as we would like to help produce well rounded citizens and exceptional individuals beyond the chess board. We will continue to communicate through different mediums as and when we roll out our programs so that all interested can know how to get in touch with us and enroll..
We believe that with our partners who have made this dream come true so far being Mascom, Africa Chess, Botswana Chess Federation, Botswana Association for the Blind and Partially Sighted, Mochudi Resource Centre, Kwa-Zulu Natal Chess Academy, Cally Clothing , Pro Ads, Dynamites Volley Ball Club, different media houses who have been very supportive of this idea since its birth and many more other partners who will join us along the way we will achieve great things together. I thank you very much for your attention and once again for your presence here today and give back the stage to our MC.